One month ago, our rainfall values, combined with dry ground conditions, indicated early drought conditions. If the cool/cold fronts of Fall and Winter do not result in rainfall, the conditions worsen. Right now, it is drizzling, and we’ve already had 3 1/2 inches of rain in the last 36 hours –with more expected over the next 3 days. Reporting of Minor Flooding and power outages began Saturday evening and continued through Sunday. I had hoped for rain before winter, but didn’t expect this! We are in mid-October, rather than early February, so the abundantly lush green growth on trees, shrubs, ornamentals and vegetables will soon be in for a shocking environmental change up — frost. With more rain and mild temperatures, the greenery will recovery and continue growth — until the freezes (at least 2 or 3 solid freezes leave plants ready for winter dormancy (above ground). The temperature range will be dropping by the weekend, with highs around 75 and lows around 55. Finally, the Calla Lilies — the little treasure that refuses to make an appearance until conditions are “just right”. This plant is the reason to let gardens “naturalize”. 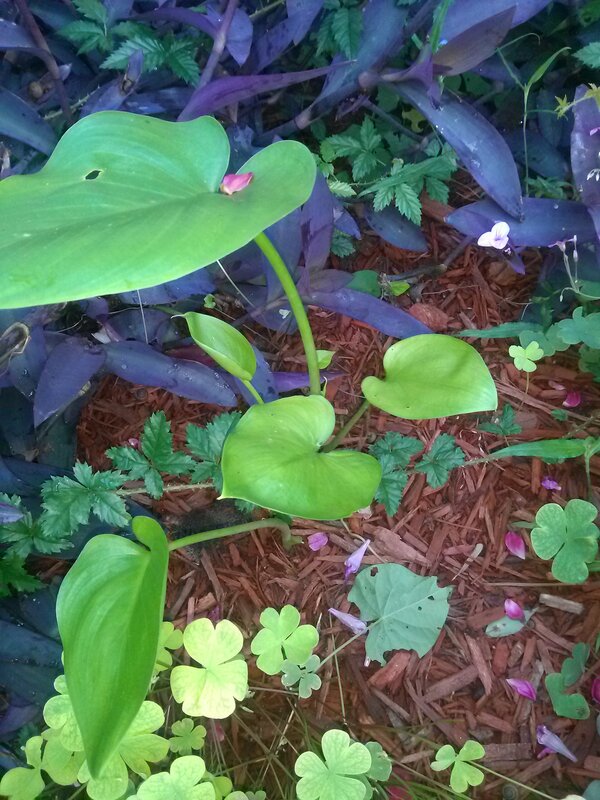 I’ve not seen the heart-shaped Calla leaves since the Spring of 2009 (the last time they were planted) — it has been too hot and too dry. I assumed the bulbs had been consumed by the environment long ago. Unfortunately, appearance of leaves does not always result in blooms — but I let the Callas naturalize and hope to see more blooms. Now the big question — are these the pink or white variety? Both Varieties were planted in this area of the garden.